Spice Box Designs: More Practice! I finally got a day off so I decided to try another piece. I used Nymo thread this time and it made a huge difference! I really like how this turned out! Then came time to cut the piece out...I really messed up there and cut it way to close. That is ok though, happy I am now making progress. Yay! I used the Android App to publish this post btw. I am not really happy with where it put the photo and I have no clue on how to change it lol. Thanks for your patience as I learn! 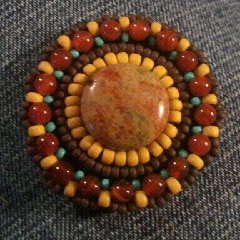 I love the colors and how you pulled them out of the stone bead, great job Marla. Thanks Therese! I love the colors as well.